Keith Heintzelinan, Ice Castles' assistant manager, carves out chunks of ice with machinery Wednesday, Dec. 20, at the site in Dillon Town Park. Glenys Hunt carefully harvests icicles during the construction for the Ice Castle Wednesday, Dec. 20, at the site in Dillon Town Park. 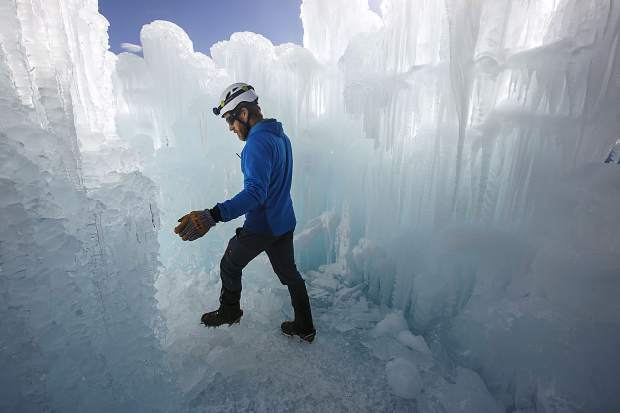 Dan Beck, Ice Castles' site manager, navigates his way around the site Wednesday, Dec. 20, in Dillon Town Park. The ice castle during construction Wednesday, Dec. 20, in Dillon Town Park. 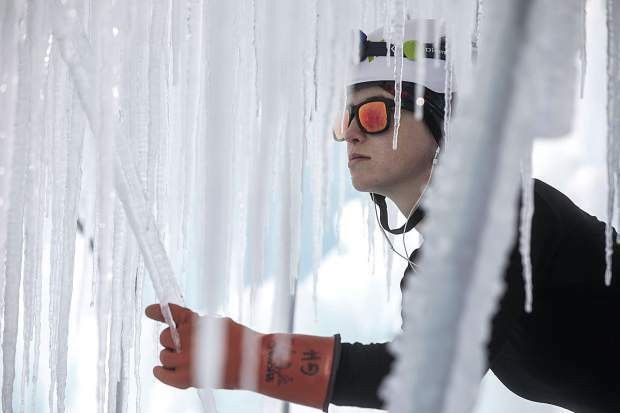 Helan Dubas harvests icicles during the construction for the ice castle Wednesday, Dec. 20, at the site in Dillon Town Park. Ice Castles under construction Wednesday, Dec. 20, in Dillon Town Park. 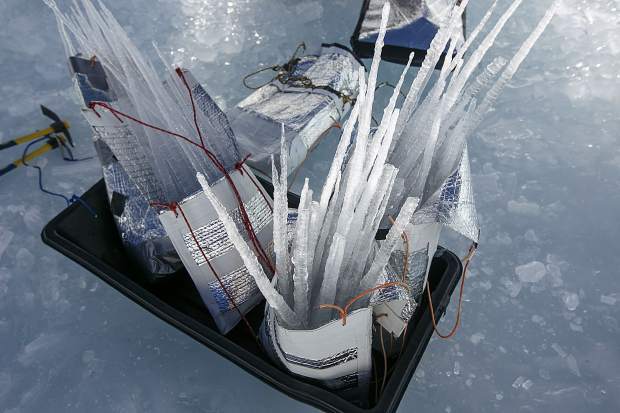 Icicles put in bags for construction of the Ice Castles Wednesday, Dec. 20, in Dillon Town Park. 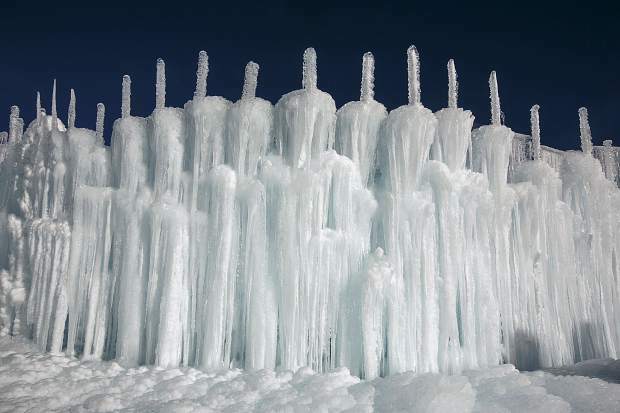 Ice Castles grown with sprinkler equipment and freezing temperatures Wednesday, Dec. 20, in Dillon Town Park. 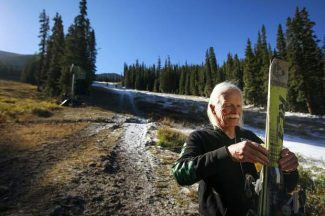 Dan Beck moved to Silverthorne to be a ski bum seven years ago but he hasn’t had much time to hit the slopes in the winters since. 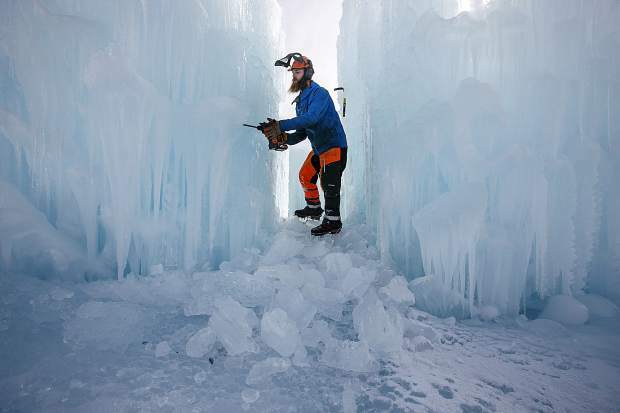 Instead, he puts in grueling hours with a crew of 15 to 20 people building up and then maintaining magnificent ice castles, locking several million gallons of water into intricate mazes of tunnels, slides and half-frozen waterfalls. 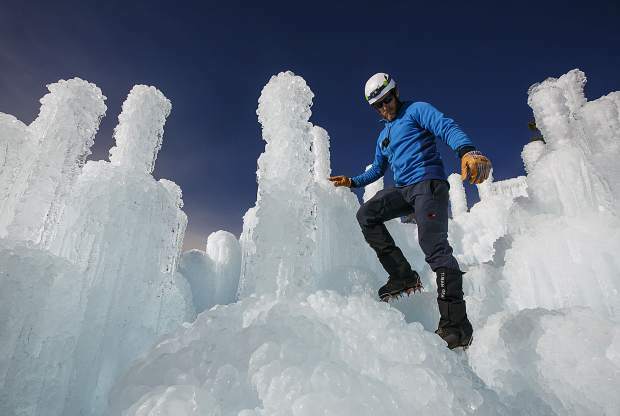 “It’s kind of crazy when I look back on it,” he said during a walkthrough of the still incomplete Dillon ice castle on Thursday. Beck got started in the trade after seeing a “help wanted” ad at the south branch library in Silverthorne. 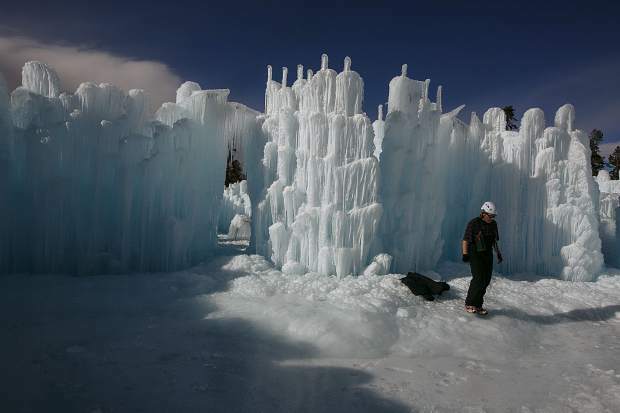 He turned out to have knack for ice, and by the next year was a site supervisor for Ice Castles, a Utah company that builds a half-dozen castles around the country each winter. This is the first year Ice Castles has come to Dillon, setting up shop at Town Park. When it opens to the public on Dec. 27, it will include a 50-foot ice slide, crawl tunnels, a throne and a host of other icy features. On Thursday, there was still plenty of work to do, with crews still rushing to make up for lost time after an unseasonably warm start to winter. 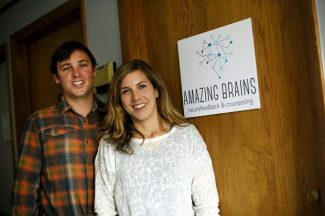 “We were able to start growing on November 17, but then we had to stop for a while and we shrank,” Beck said. 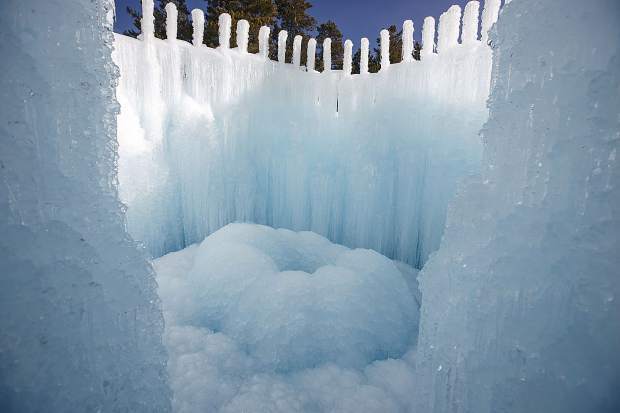 When he first started, Beck quickly learned that building ice castles is never straightforward. Since early December, when it was finally cold enough to keep building, he and his team have been putting in 80-hour weeks to get the castle up in time for the holidays. “It’s the weather — you can’t control it,” he said with an easygoing shrug. Beck and his crew build the castle around a network of pipes extending up into the air and ending with sprinkler heads that dribble out water. Overnight, they grow taller, while horizontal pipes drop wide curtains of icicles. 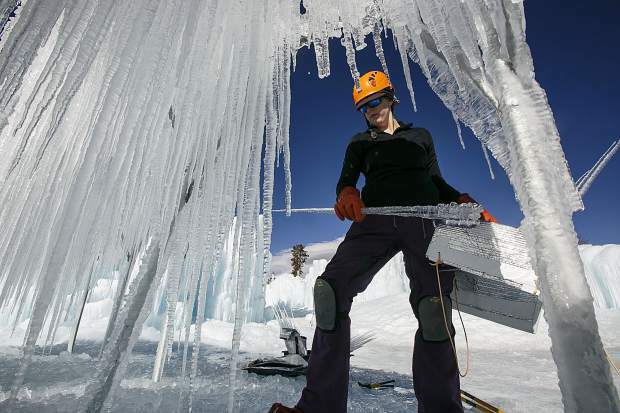 “The actual building process with the ice is pretty basic geometry, but it definitely takes some time and you’re really slow at first and all of your icicles fall down until you get the bonding technique down,” Beck said. In open spaces within the castle, crews have set up icicle farms, or nests of hanging chain link connected to a central sprinkler. Overnight, hundreds of icicles form underneath, and in the morning, workers harvest them to use as the day’s building material. At places where they need to build walls higher, workers will pull an icicle from a holster wrapped around their waist and use slush to bond it to the top of the ice surface. They’ll then run sections of pipe to the top of it, and by morning it will have widened it a thick column. The operation draws about 300,000 gallons of water a day during the building phase and will use 10,000 to 30,000 gallons a day during the maintenance phase, Dillon town officials said. But since the water will eventually melt and flow back into the groundwater, it’s considered a non-consumptive use. Depending on the temperatures and humidity, the growth can sometimes be disappointing. But the feeling of coming back in the morning and seeing how the castle has expanded is one of the thrills that has kept Beck coming back each season. Sometimes, though, that living thing can cause headaches. The castle walls look like frozen porcupine quills all matted down toward the ground. The delicate appearance of the ice betrays its strength; even narrow arches can be strong enough to walk on top of, because ice grows exponentially stronger the thicker it gets. Unlike icicles hanging from buildings or tree branches, those inside the castle are remarkably stable. Because the ice is bonding with itself, rather than a gutter that warms in the sun, it’s not at risk of falling spontaneously. On Thursday, there was plenty more building to be done. 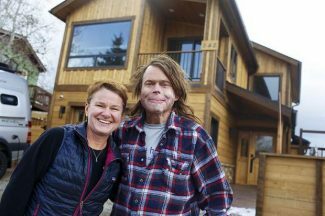 Like being a ski bum, Beck has found that the castle-building trade is a lifestyle of its own: He had worked 21 days in a row, averaging 13 hours a day. Only when the building slows down will he have a day or two off to visit his wife in Salt Lake City, where he lives during the summer. The big payoff will come when the first guests start streaming into the fully built castle, glowing with turquoise and lavender lights embedded in the ice. “Building something that’s incredibly beautiful that can bring joy thousands of people is very rewarding,” Beck said. 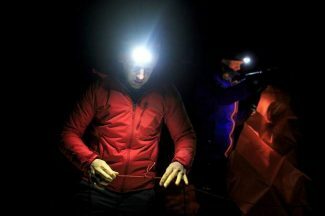 This article originally published on summitdaily.com on Dec. 23, 2017. 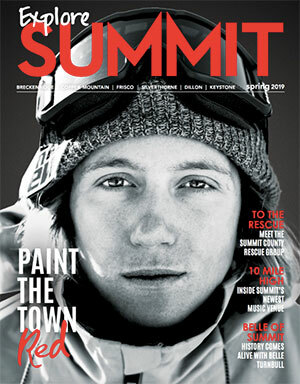 It appeared in the 2018 Explore Summit Spring magazine.